Not long ago the specifications of the Sony Xperia L would be regarded as being impressively high-end, but these days the features of this Android smartphone are definitely more mid-market than that. Based around a 1GHz dual-core CPU with 1GB of RAM and 8GB of storage (plus a microSD slot), the Sony Xperia L has a 4.3" 480 x 854 pixel display on the front with a VGA resolution video calling camera, and on the back is an 8 megapixel camera capable of 720p video capture. With these specs, the Xperia L can perhaps be considered as the successor to last year's Xperia P.
This is an Android 4.1 smartphone that does everything that you would expect an Android smartphone to do, including supporting HSPA+, WiFi and Bluetooth 4 connectivity. It also supports GPS, is NFC capable and comes with a FM radio. The Xperia L is gently curved on the back, a characteristic that we've seen on a few Sony and Sony Ericsson devices in the past. It comes with a 1750 mAh battery which is quoted as giving a maximum of 9 hours talktime and nearly 19 days of standby time, although real-life use will be considerably less. 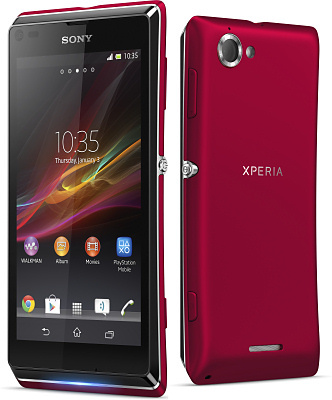 The Xperia L measures 129 x 65 x 9.7mm and weighs 137 grams. Available colour schemes are white, red and black. Fundamentally, this is just like any other recent Sony Xperia handset, and it looks like a competent midrange device if you are upgrading from a previous generation of Xperia. No guidance was given on price, but we guess that the Xperia L will cost something in the region of €350 when it hits retail channels during Q2 2013.